Applicants are shortlisted according to a scoring system against our person specification. Candidates invited to interview must take the numeracy and literacy skills tests and the interview is subject to passing both tests. Shortlisted candidates are invited to spend the day at Oakthorpe Primary School. Summative assessment by class teacher. 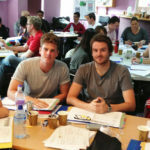 During the 3-5 day school experience, candidates are observed in a variety of situations and by a range of staff. We look at their approach to teamwork, relationships with staff and children, professionalism, flexibility and initiative during this period. It is also an extended opportunity for the candidate to confirm that they wish to become a teacher and that this is the right training route for them. As far as possible, we expect this to be completed by the end of the spring term. Successful candidates are then offered a conditional place on the course. Observations made by class teachers and the training managers, applications, interviews, subject audits, and trainees self-audit of prior experience, all inform the needs analysis and development of a training plan once the candidate is registered on the course. An enhanced disclosure check is required for entry to Initial Teacher Training. We ask applicants to confirm that they agree to a check by the UK Disclosure and Barring Service.